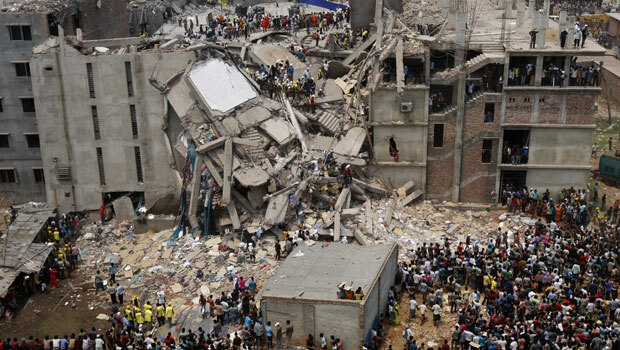 The latest tragedy that hit Bangladesh’s ready-made garments industry on 24th April has shocked the international community. Scores have died, many more are missing. The news has been given extensive coverage by major TV channels and in print media across the world, contrary to the generally indifferent media coverage of such calamities in poorer countries. The misfortune and substandard treatment of impoverished factory workers in Bangladesh has been laid bare. 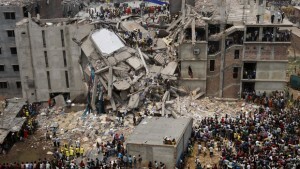 The recent human catastrophe caused by the collapse of an eight-storey building that housed five garment factories ‘is not the first incident of its kind in Bangladesh.’ Back in 2005, a similar building collapse left 64 workers dead. According to the BBC, the factory owner was then arrested, but did not serve any time in prison; since then, ‘there have been fires, stampedes and other incidents at various garment factories, causing hundreds of deaths.’ The last major disaster happened on 24 November 2012 in which 117 workers perished in a fire at Tazreen Fashion factory in Ashulia, near the capital Dhaka. With over 370 dead, this time it has generated wider debate on the plight of workers, health and safety concerns in work places and exploitation of people in the developing world. For millions of Bangladeshi citizens this has again highlighted the deep-rooted political and economic corruption of the ruling class and the loss of moral compass of the government leaders. Very few in Bangladesh believe that their government will bring any meaningful change to the miserable condition of millions of factory workers. According to The Daily Telegraph, the Bangladeshi government has refused outside help for fear of ‘damage to national pride’. The owner of the Rana Plaza that housed the factories was on the run since the collapse; to jubilation across the country, Sohel Rana has now been arrested near the Indian border by the troops from the Rapid Action Battalion (RAB). Bangladeshi media widely reported the news that Mr. Rana pressured the workers to go into work even after police had ordered an evacuation of the building after cracks appeared the previous day; the factory management simply ignored the order. Two other factory bosses and two engineers have recently been arrested. But given the past inaction of the government, people are not confident whether the owners will be taken to task, the health and safety of workers will be guaranteed or that work ethics will be changed. Bangladesh has one of the largest garment industries in the world; ready-made garments made up 77.1% of Bangladeshi exports in 2009-10 and the textile industry accounted for 17% of its gross domestic product (GDP). More than three-quarters of total exports come to Europe and the US. The value of exports increased dramatically over the past 30 years; in 2012 it was worth almost $20bn. But the garment industry in Bangladesh has been marred with triple injustices since day one: dismal low pay, little or no employee rights and dangerous working conditions in factories. The complaints about this ‘slave labour’ in the 21st century have fallen on deaf ears; political arrogance and economic corruption of successive Bangladesh governments and an indifference of the western companies that happily milk the profits have worsened the situation. Sohel Rana is a local politician connected to the ruling Awami League and, like other political party cadres, was used to exert intimidating influence on the employees and local people. This was the main reason why so many workers entered the ill-fated building even after knowing its condition. Party hooliganism is not uncommon in Bangladesh, but this has multiplied in worrying proportions during the tenure of the current government. Some factory owners who are political cadres of the ruling party are known to use their employees as political pawns. For some it is the way of moving into the world of influence and affluence within the span of the government. Most of these ‘hooligan’ politicians forget their ordinary roots and indulge in vulgar display of wealth and power. The irony is some of these party cadres even spend their illegally earned wealth to publicly feed poor people or donate to charity causes to display their new status. People around them may detest their ‘Jekyll and Hyde’ type double standard, but are powerless to face them as the law and order forces are either soft on them or complicit in their illegal earnings. Bangladesh’s factory workers produce high quality, but low cost, clothes for western consumers through companies like British high street retail chains Primark and Matalan. This raises a serious question about the ethics and standard of ethical trading of these companies. It is claimed that last year several retailers, including Wal-Mart, the Gap and H&M, rejected proposals aimed at improving safety following the November 24 factory fire. A protest was organised recently in front of Primark’s store in Oxford Street to send a clear message to Primark that the deaths in the Bangladesh factory building collapse were not an accident – ‘they were entirely preventable deaths.’ They demanded compensation for the victims and want these companies to end “appallingly unsafe factory conditions” in Bangladesh. Graciela Romero, of British Charity War On Want, says firms who use Bangladeshi products must “safeguard the life of these workers”. Primark apparently has accepted its share of responsibility and said “it is providing assistance in the region, and will take further steps in due course.” It is important these companies stick to their promises and the international community takes some moral burden on alleviating the plight of Bangladeshi factory workers. What can we do to help? Ill share the story, but is there anything else we can do? There’s a number of ways you can help. -donate for the victims here: https://www.justgiving.com/savartragedy/. -raise awareness through social media of the situation and encourage friends/family to be conscientious consumers. Consumers have the power to change things. -write to clothing companies that outsource to Bangladesh to demand they secure better conditions for workers, offer long term compensation to victims and pressure the Bangladesh govt for change. Brands include Cherokee (Tesco), George (Asda). Gap, Primark, H&M, Benetton, etc. Also demand that they don’t simply pull out of Bangladesh as that will only hurt the workers and the country economically (Disney has pulled out). -write to the Bangladesh authorities and consulate (http://www.bhclondon.org.uk/) to demand they give safer working conditions, a living wage and rights to join trade unions for their workers. -there’s a major protest movement to take place in Bangladesh on May 5 (#5may #siegedhaka on Twitter) that will address many injustices and corruptions in the country, including the garments industry tragedies.